B/W. These past couple of days have been super hot here in NY and dressing up has been the last thing on my mind, so back to basics it is! I scored these silk whyred pants on a sample sale years ago and they are one of those perfect pieces I always whip out when I’m in a hurry or don’t have anything to wear. Actually all of the pieces in the look above are things I wear on a weekly basis which probably proves that I should listen to my mom and invest in more timeless basics. They are after all the foundation of your wardrobe! T-SHIRT &Other Stories. PANTS Whyred. BAG Proenza Schouler ps1. SANDALS Tibi (on sale here!). JEWELRY Fashionsquad x Cooee cuff, bracelet and ring + Hérmes bangle. I tend to gravitate to the same basics regularly as well. Love this simple and classic look! The bracelet is sooo nice. I love basics! They’ve somehow become in my favorites!! Basics are always a good choice and you look fabulous ! definitely i love with your sandals the most !!! Nice outfit, i really like the pictures! Lovely. Loving the Hermes bracelet! Those sandals are absolute spot on for what I am looking for, many thanks coming your way! i love this whole look! and your smile is golden. Perfect outfit even if they are basics! You look great! I love your bracelet! Love your sandals, it’s unique and I love the mixing with white and black, stands out a lot ;)) and adore you bag of course! Love it! Basics may be great! To invest in good basics is such a great thing to do! Your pretty as always! Lusting over that PS1, obsessed with your basics! I can definitely agree with investing in timeless classics. It seems I’ve been wanting to wear my white tee with black skinnies every day! Fab outfit as usual! Love your style chick! Basics last forever, we agree. Black and White are so great – year round! Never ceases to amaze us! Love your sandals. It’s always good to go back to the basics! Simple and elegant outfit. So lovey, Carolina! I love this minimalistic and natural scandinavian look! Loooooove this bag! You are beautiful! You’ve got such a lovely smile! and you make basics look really chic. Beautiful outfit!!! You look gorgeous!! great decision to get those pants! I love this outfit! Plus, your hair is so so amazing, please do a tutorial on it! Basic are always a perfect solution! basic never looked so good! And the sandals are amaze. your hair es so pretty!! Envious of your upper body! It’s nearly impossible for me to look so confident in a sheer white tee. My boyfriend may have to fall asleep next to the Hulk tonight, I’m green with jealousy! Love how stylish these basics look! I love how chic this simple outfit is! Love this casual monochrome looks of classic staple pieces. Love the black and white look. Great outfit! love your style. simple and chic. is this really your page or someone else pretends to be you? love the shoes, and simple yet chic look. 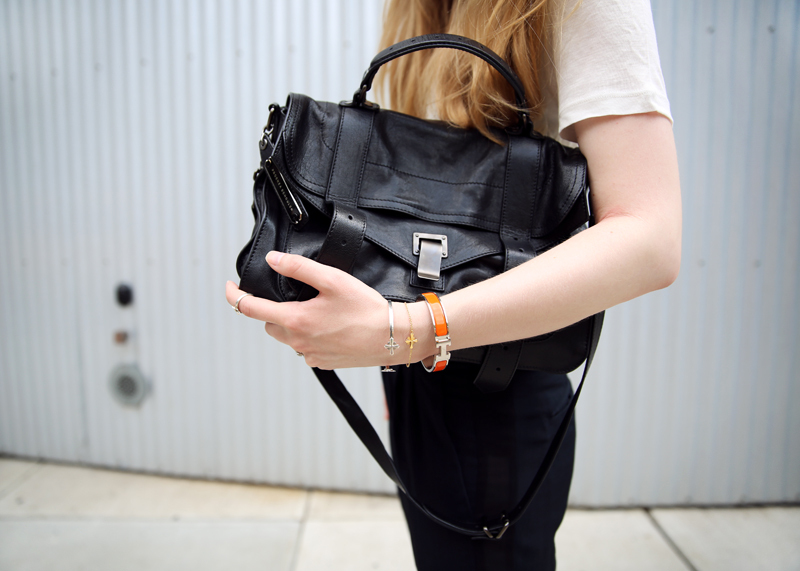 Love the pop of orange in the Hérmes bangle! Once again, your outfit is perfectly gorgeous! You look amazing, so fresh and cute!!!! You always look really great , no matter what type of outfit you wear! love these basic peaces!! the sandals are perfect! You are amazingly pretty and I just loooove your blog! I would be sooooo happy if you could check out my brand new blog. Basic pieces are def an investment cause they last forever, while less should be spent on trendy pieces I think…anyway you look great! what size ps1 is this? medium? ?